Thread: 10 quotes by Rahul Gandhi that made one go Aha! Congress President Rahul Gandhi?s recent 4-day visit to the United Kingdom and Germany, from August 22 to 25, has created a flutter in India. 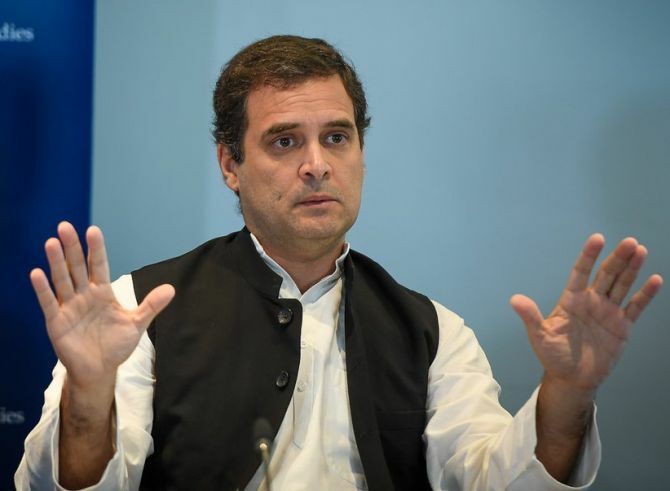 From the 1984 anti-Sikh riots to demonetisation, from Rashtriya Swayamsewak Sangh to the Modi government?s policies, Rahul spoke on various issues openly, at times at variance with the truth -- like on the 1984 anti-Sikh violence. Wherever he went, he took potshots at the RSS, the Bharatiya Janata Party and Prime Minister Narendra Modi who he charged with dividing the people. While he compared the RSS with the Muslim Brotherhood, he also attacked Modi for his government?s Pakistan and China policies. If you do not give people a vision in the 21st century, somebody else will. And that is the real risk of excluding a large number of people from the development process. It's very dangerous to exclude people in the 21st century.